Selvick Marine Towing won best Irish entry. Submitted photo. 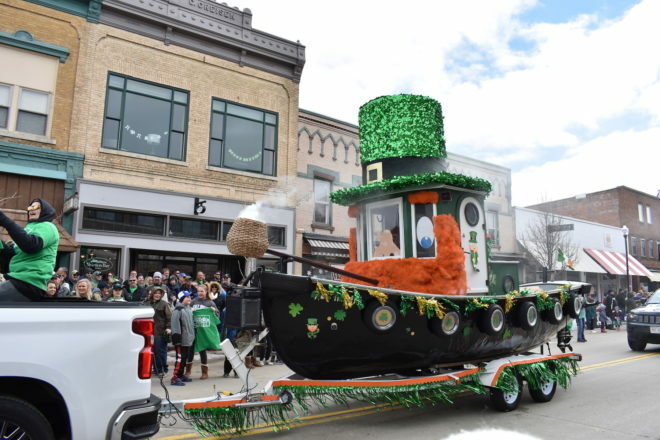 More than 30 businesses and organizations participated in the 26th annual St. Patrick’s Day Parade in Sturgeon Bay on March 16. The award for the best business entry went to Bay Shore Outfitters for its creative float and handmade cabbage heads to celebrate “St. Cabbage Day.” The Sturgeon Bay High School Band earned the best nonprofit entry for its festive outfits and tunes. And Selvick Marine Towing won best Irish entry for its decorated tug boat, Irish spirit and giant, green, sparkly St. Patrick’s Day hat.